Note the right hand side. I couldn't wait to cut it so it wasn't fully set up... My bad. This pie is a memory from childhood, from the same memory as the custard pie (here) I posted several months ago. An unpromising start will thicken up. Just give it time. To abbreviate the story, when I was very young there used to be “Pie Aids” in a neighbouring village. These gatherings used to be for fundraising for the local Women’s Institute. Members brought pies and sold them either by the pie, or more commonly by the slice. It was a wonderful social gathering where people could catch up on the latest gossip as well as show off their pie expertise. 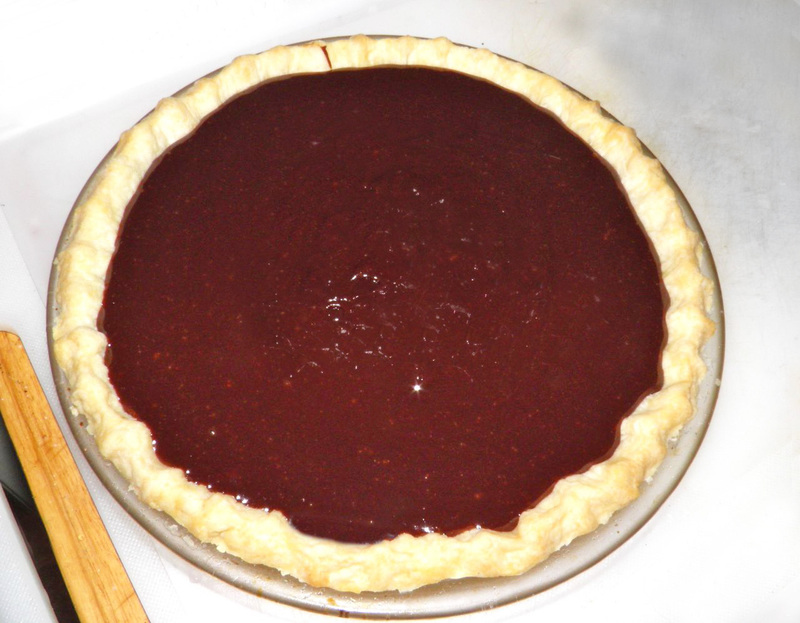 There was one lady who always brought chocolate pie. (If memory serves me, her name was Mrs. Gardener, but I’m possibly wrong.) It was her specialty, and was one of my two favourites. 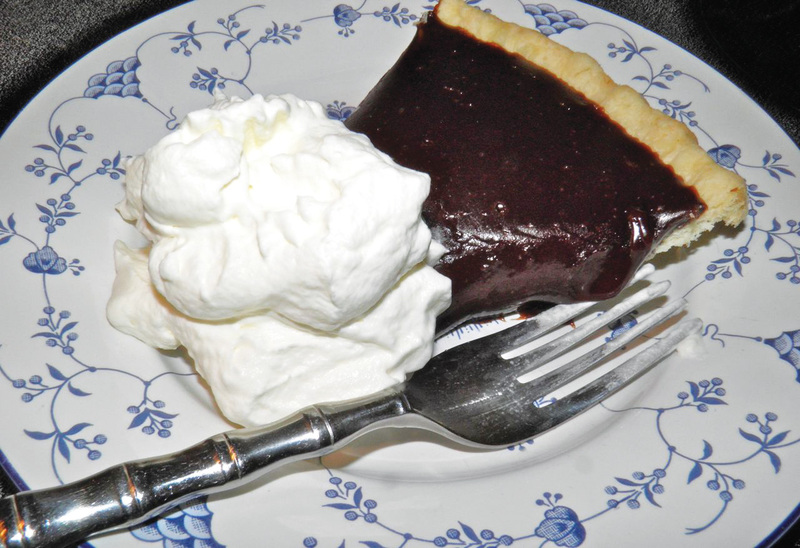 Dark, firm and delicious – much like ganache in a crust – it was always served with a dollop of whipped cream. Of course she has long since passed to her reward, bless her. But the memories her pie made still bring warm feelings of home. As the filling cooks it will thicken dramatically. Don't whisk too much or you'll introduce unwanted bubbles. Just a few additional words. Don’t confuse this pie with German Chocolate Pie. The German versions all seem to have some sort of coconut/nut topping. It appears the “German” in it (as well as German Chocolate Cake with similar topping) is the result of a 1950s recipe published in a Dallas, Texas newspaper for “German’s” (possessive form of the word) Chocolate Cake. German’s was a baking chocolate maker. General Foods started distributing the recipe and dropped the apostrophe, giving the recipe and topping the false impression of originating in Germany. Some cooks also put meringue on top and bake until golden. I’m not a fan of that either. Lemon pie only, please. I think both nothing short of ruinous on a chocolate pie. But that is only my opinion. Give me a chilled slice of sweet, sweet chocolate, some whipped cream and a fork. That’s all I need. Hopefully you’ll agree. It really needs to set up at least overnight in the refrigerator. Make your favourite 9” pie pastry, roll it out and place in a pan. Let the unbaked crust chill for 30 minutes before “blind baking.” See about and how to blind bake here. While the crust is baking, melt the semi-sweet chocolate square with the milk and let cool. 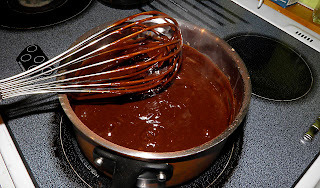 Combine sugar, flour and cocoa in a deep saucepan. Mix well. Beat the egg yolks with the milk. Slowly add to the sugar/cocoa. Place the pan over medium heat and let cook, gently whisking until very thick. You can also use a flat bottomed spatula. 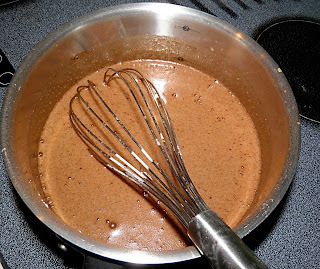 The mixture will become the consistency of very thick pudding. Don’t let it catch to the bottom of the pan or it will burn. Remove the chocolate filling from the heat and stir in the butter and vanilla until combined. Quickly pour the filling into baked pie crust and refrigerate overnight. The filling will begin to set up as soon as it's off the heat so move quickly. 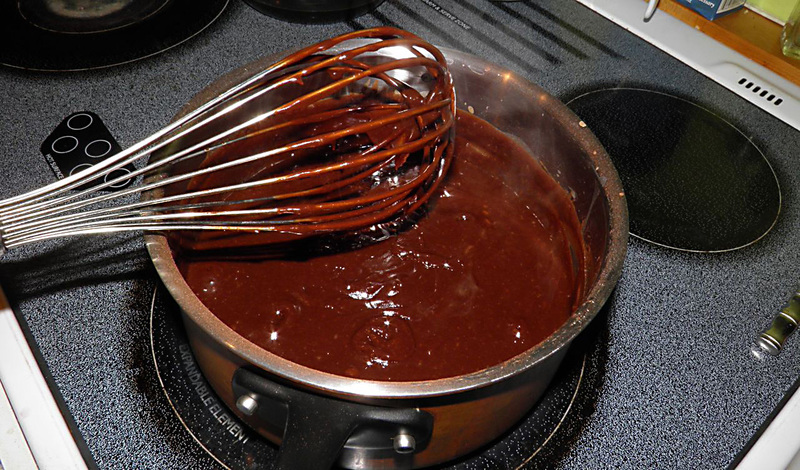 An offset spatula dipped in water can help smooth the surface if it’s too lumpy (or just hide it with whipped cream!). If you wish, serve with whipped cream. 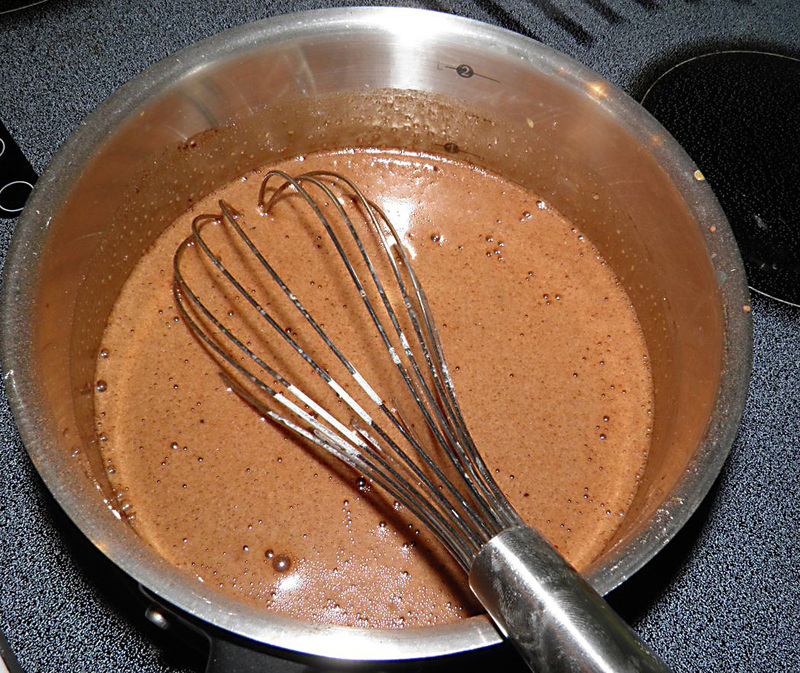 * You’re essentially making a cross between ganache and chocolate pudding, so if you wish I don’t see any problem with adding a little Grand Marnier® or other liqueur. It won’t be traditional, but will be very tasty.